I have a friend who is fond of puns. I shall not name him, for he is more fond of them than is right for a man to be. Nevertheless, he remains my friend, and when he believes that our Dungeons & Dragons game needs an additional dose of depravity (which is all the time) he does not hesitate to contribute a pun or ten . So this post is dedicated to our anonymous punmaster. He knows who he is. 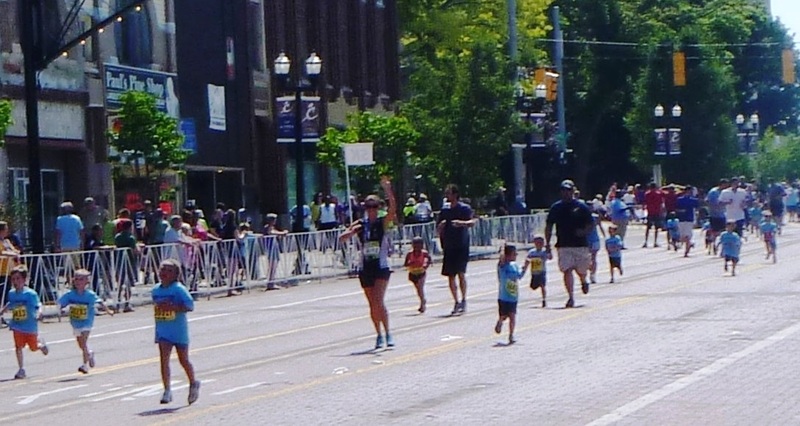 At any rate, last Saturday was the 37th running of the Crim Festival of Races, and over 15,000 runners turned out for it. Most of them took part in the signature race, the 10-miler, although there was also an 8K, 5K, 5K walk, and a Teddy Bear Trot for the little ones. The 10-miler draws top-flight runners from all over the area, and even some of the world-class elites. 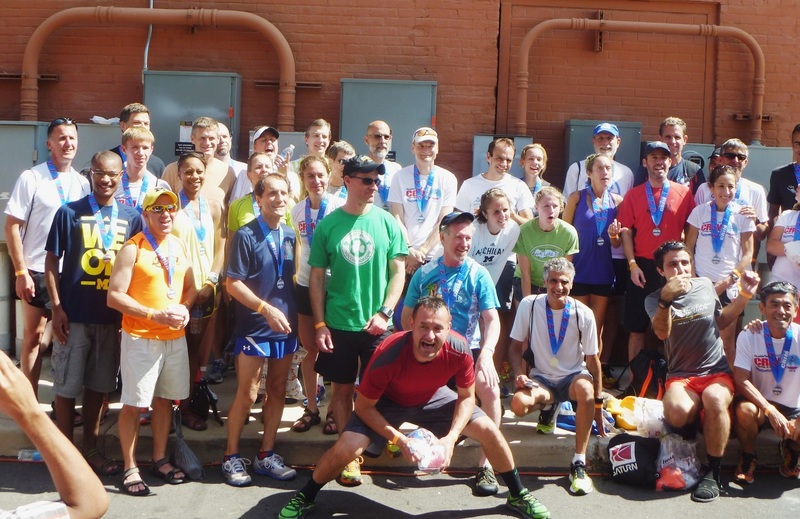 The top 16 finishers ran the 10 miles in under 50 minutes. That’s better than a five-minute mile the entire way, including the famous “Bradley Hills” that occur around the halfway point. That’s seriously fast, folks. I’m happy to say I met my time goal, which was remarkably close to the elite times – if you consider the current age of the universe. And how did I do in my age group? Did I mention what a beautiful morning it was for running? After I finished and refueled with a lime Popsicle and an Arnold Palmer, I wandered around the area to see what was to see. Despite my daughter’s snarky comment, which you can read in the previous post, security was visible everywhere and downtown Flint had put on its best face for the event. It’s no secret that the city suffered heavily in the recession, and the signs are still quite evident, but there are also signs of recovery and rebuilding going on. 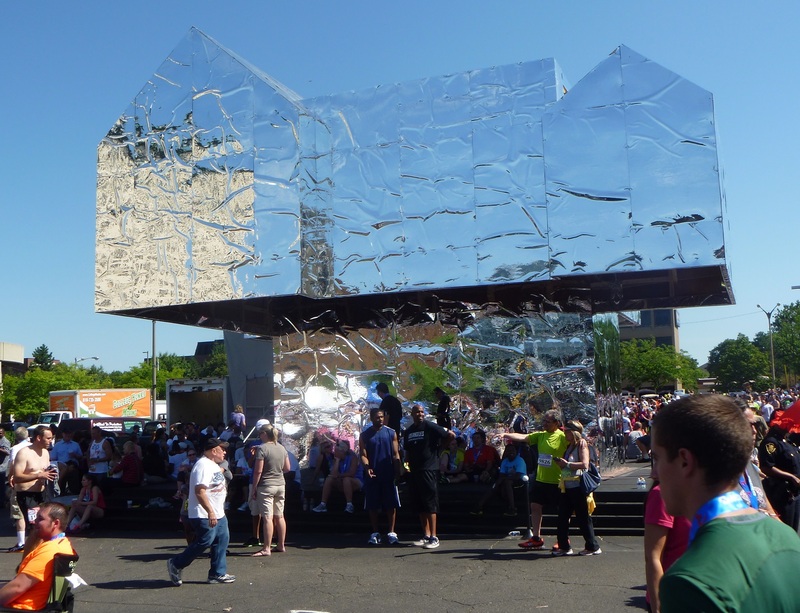 The post-race party area contained this structure, which turned out to be a work of public art in progress. You can see what it’s intended to look like at this link. I was told, however, that it’s at least a month behind schedule, which won’t leave a lot of time for enjoying it even if it is finished soon. I biked to church this morning wearing my Crim shirt, as I knew at least two other people would be there who also ran the Crim. Any worries I had about bragging disappeared as soon as I saw one of them ushering. He was wearing his medal. He-Who-Shall-Remain-Nameless once entered a punning contest to find out if he was really as skilled as he thought himself to be. He submitted a list of 10 of his best puns, and hoped at least one of them would win a prize. But no pun in ten did. This entry was posted in Running & Cycling and tagged 50, Crim, fitness, Flint, PR Fitness, puns, Running. Bookmark the permalink.